Network protocols are a key topic for discussion for House of Worship techs, with their significant cost-savings and added flexibility. One of the latest products to offer networked digital audio transport is also one of the simplest: Dante Via™, a software package developed by Audinate®, the company behind the ubiquitous Dante™ networking protocol. The software package Dante Via comes along on the back of this solid groundwork, promising to infiltrate even non-networked sound cards and upgrade them for access to this growing population. The key to it is Dante Via’s ability to build bridges between existing standard soundcards, giving the user the choice of which components to upgrade rather than having to invest wholesale in a completely new platform. 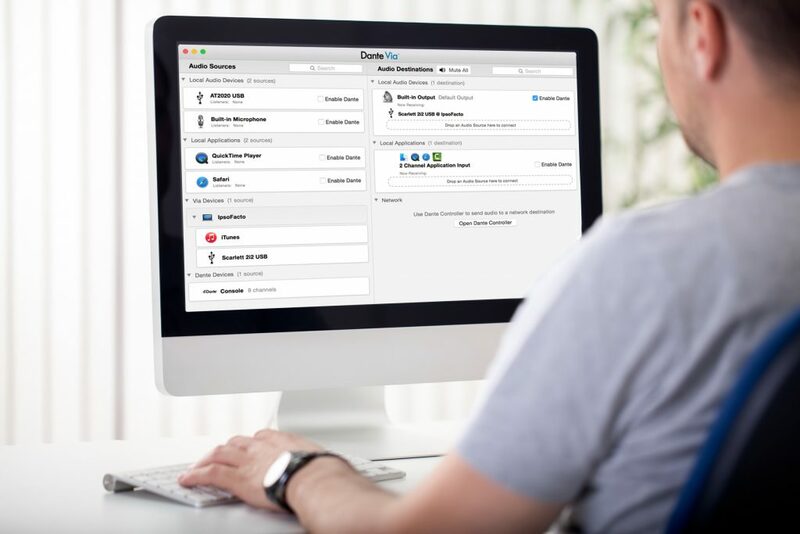 With Via, users can send audio between two Via-equipped PCs and Macs using their existing network — but it also allows audio to be sent-and-received by your computer from the Dante network. Allowing users to ‘plug the virtual gap’, enables unique engineering creations — such as low-cost ways of creating overflow spaces, monitoring single Dante channels, and pushing specific feeds from computers to various Dante devices. You can also isolate specific computer applications and have them play-out over Dante, without other applications’ sounds (e.g. system notifications, Skype etc.) chiming in. It’s easy to see how Dante Via can streamline audio around any HOW center with multiple rooms, multimedia ministry dimensions or just complex architecture that would stretch more traditional installation techniques to the limit. Lee Fields, for example, is the sound engineer for Bayside Church in California as well as being an experienced FOH guy, handling Lincoln Brewster’s tour sound. Bayside’s four separate campuses in the areas across Sacramento and Roseville play host to an endlessly varied schedule of worship events and meetings, each of which seems to want something different from the audio infrastructure every time a congregation gets together. Through such an easy gateway, there’s every chance that HOW users among many others will gain confidence in the whole concept of networking and use Dante Via as a stepping stone into a more advanced understanding of its techniques – which, quite naturally, can only enhance production and inspire creativity still further. As an introduction to Dante itself, maybe Via will go some way to alleviating the protocol panic that all that choice foments – with a good deal less pressure on the purse, too. Phil Ward is a veteran AV writer with over 20 years’ experience in the pro audio industry, having also edited Pro Sound News Europe, the launch of Installation Europe and Pro Sound News Asia. He now writes regularly for PSNEurope, Lighting & Sound International, Lighting & Sound America and Pro Audio Asia/Middle East, and makes occasional contributions to Mondo, AV Magazine, RedShark, InAVate and other industry media forums.